The Nigeria Football Federation's tense working relationship with coach Stephen Keshi looks set to continue. The federation has asked Keshi to explain several incidents it is unhappy about. Most recently Keshi did not attend Tuesday's technical committee session with the NFF. He has also been asked to explain going on leave without permission and so missing a reception hosted by President Jonathan Goodluck in February. "It is important we draw your attention to previous actions whereby you travel out of Nigeria without NFF's express permission," read the NFF letter to Keshi. "Specifically, you travelled out of Nigeria before 13 February 2014, the day President Jonathan received the Africa Nations Championship (CHAN) team, causing us huge embarrassment. "Your request for leave approved by the NFF was from 15 February - 10 March 2014 but you left before 13 February and returned 26 March. "The Technical Committee meeting on 25 March was called off because you said you had flight hitches from USA. "As a responsible organisation, we have no other option than to issue you a query to explain how all these events unfolded." Despite missing the Technical Committee meeting Keshi did take part in a round table discussion with Nigerian journalists in Lagos on Tuesday. However, the NFF has not made public what actions it could take if it is unhappy with Keshi's explanations. The two sides had been enjoying a more cordial relationship in recent weeks after rows over unpaid salary and speculation about the appointment of a foreign assistant for Keshi. He decided against resigning from his post just hours after leading the Super Eagles to their first Nations Cup title since 1994, following disputes with the NFF. 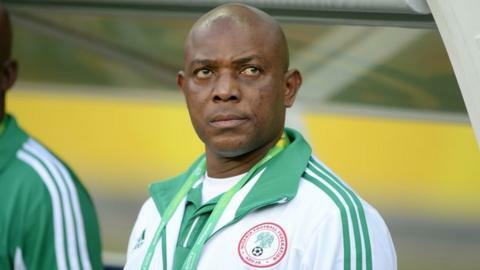 Four months later, the NFF president, Aminu Maigari, publicly revealed that Keshi would no longer be solely responsible for selecting the squad. Maigari queried Keshi's selection for the 2013 Confederations Cup in Brazil, which Nigeria exited at the group stage, and said he was dissatisfied with the current set-up. And in December, the NFF paid Keshi part of the seven months' salary he was owed, only weeks after he described the situation as "disrespectful and unacceptable".